It just keeps getting worse, doesn’t it? Mike Glennon played fairly well. He threw for 273 yards and two touchdowns, both to Vincent Jackson, who finished with 114 yards receiving. The Bucs actually had the lead at the half, and were only down by one in the fourth quarter. But this time, the defense was not at its best. 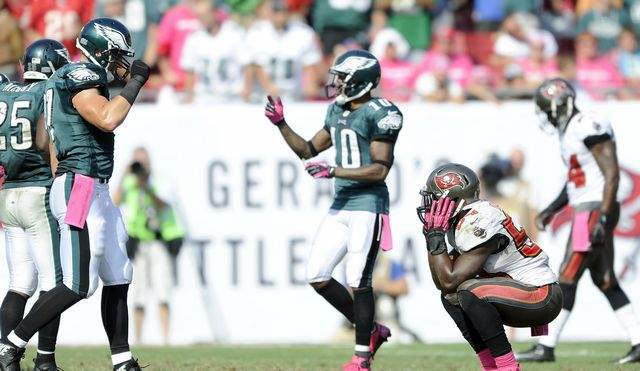 They allowed Nick Foles to throw three TD passes, including two to DeSean Jackson. That’s the game in a nutshell; now back to Schiano. How much longer will the Glazers wait before they pull the trigger on this guy? In my opinion, it can’t some soon enough. First you have the fiasco with Josh Freeman. Then there’s the report in USA Today that Schiano was the one who leaked the information about Freeman taking part in a substance-abuse program. Then you have all those penalties – a sign of an undisciplined team. That’s coaching. Finally, consider this: Schiano has only won one of his last eleven games. The Bucs opened the pocketbook in the offseason and brought guys in to win NOW. Schiano hasn’t done that. Bucs Now 0-6; Can We Please Fire Schiano?